The South Carolina eviction notice forms are used to provide notice to tenant that landlord will seek eviction of the tenant if tenant doesn’t rectify the breach by either curing the problem or by moving out. If tenant fails to move out or fix the situation, landlord may then be able to begin eviction proceedings by filing an Application for Ejectment (include the Affidavit and Itemization of Accounts for non-paying tenants). This form is a sample. You should go to your Local Magistrates’ Court to obtain the correct form. The court will issue a Rule to Show Cause which you will have to serve on tenant along with the affidavit. You must make sure that service is done correctly. If the landlord prevails and tenant does not appeal, the court will issue a Writ of Ejectment within five (5) days of the judgment. The tenant will be notified that he or she has 24 hours to vacate before the sheriff comes. 5-Day Notice to Quit (Non-Payment) – A landlord must deliver this form in the event that tenant has failed to pay rent when it is due. The tenant will have five days to comply or vacate. If tenant does neither, landlord can proceed in court. 14-Day Notice to Quit (Non-Compliance) – A landlord must use this form in the event that tenant is breaching the terms of the lease, other than for non-payment of rent. Tenant will have 14 days to fix the problem, or vacate the premises. 30-Day Notice to Quit (Month to Month) – This form is for use when a party seeks to end a month-to-month tenancy. A tenant can be evicted if he or she receives this notice and proceeds to stay over the allotted time. In South Carolina, rent is due on the date agreed to in the lease between tenant and landlord. If tenant is late, landlord may serve notice and tenant will have five days to pay or face eviction proceedings. Step 2 – If tenant does not respond to the notice in the amount of time provided, landlord may then proceed to the Magistrate’s Court covering the jurisdiction in which the property is located to file an Application for Ejectment (include the Affidavit and Itemization of Accounts for non-paying tenants). The court will issue a Rule to Show Cause with a hearing date and landlord will have to have the tenant served by a process server. Step 3 – If tenant fails to respond or loses at the hearing, the judge will issue a Writ of Ejectment within five days of the judgment directing sheriff to remove the tenant. The sheriff must give tenant 24 hours notice. You must make sure that you have the information you need to fill out the Notice properly. Such information should be obtained from the Lease Agreement that concerns the Landlord, Tenant, and Property involved. You will also need a workable copy of the “South Carolina Notice To Quit” form. You may secure a PDF, ODT, or Word file version of this form by selecting the button (on the right) designating your preferred file type. You will need to precisely Name the individual you are issuing this Notice to. Do this on the first blank line at the top of the page. The Lease will contain details that must be transcribed onto this document. The first set of details will concern the Location of the Rented Property. Utilize the spaces in the sentence with the opening phrase “The premises herein referred…” to report the Rented Property’s City, County, Zip Code, Street Address (Building Number and Street), and Apartment Number. The next set of details will be the components of the Signature Date on the Rental Agreement. Find the phrase “In accordance…” then, report the Calendar Day, Month, and Year the Lease was Signed using the three blank spaces in that sentence. Landlords, or Landlord Agents, may issue this form to provide a Notice regarding Nonpayment, Noncompliance, or the Termination of a Month To Month Tenancy. 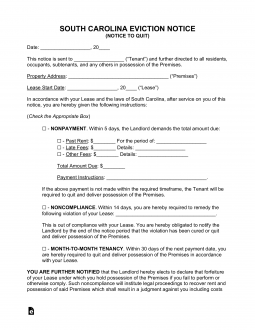 Tenants may utilize this form to end a Month To Month Tenancy as well. Any of these goals may be defined by checking the appropriate check box. The Nonpayment Notice. This may be selected by marking the first box. This will give the Tenant Five Days to Pay for a Rental Period that is Overdue or expect to have the Landlord re-assume possession. This selection requires the Name of an Alternate Authorized Agent who may accept such a payment. The spaces in this paragraph will require the Dollar Amount the Tenant owes, the Overdue Rent that must be paid, and the Rental Period that must be paid for to be entered. The Noncompliance Notice. Mark the second box to issue a Notice to the Tenant demanding he or she vacate the Rented Property in Fourteen Days if a Lease Violation is not corrected in this time frame. You will be required to describe the exact violation on the blank line. The Landlord issued Month To Month Tenancy Notice. The third box is reserved for Landlords wishing to end a Month To Month Rental arrangement. This will require that Thirty Days’ Notice (starting with the next Rental Due Date) be given to the Tenant before the Tenant will be expected to vacate the premises. This selection will require you to mark the corresponding box and report this Date of Termination in the appropriate spaces. The Tenant issued Month To Month Tenancy Notice. The fourth box is reserved for Tenants who desire to stop leasing a Property on a Monthly basis from the Recipient Landlord. If you are a Tenant in this position, then check the fourth box and report the Date you wish the Lease to end. This Date must allow for at least Thirty Days’ Notice to be given from the Date the Rent is Due. The paragraph at the end of these statements will require attention from the Landlord or Agent who is issuing this document. A Landlord or Tenant issuing this Notice must Sign the “Landlord/Agent Signature” line provided. The Delivery Testimonial which makes up the “Certificate of Delivery” section will consist of a statement that must have the Delivery Date and Recipient entered onto the spaces contained in the statement. The list of statements below will also need attention from the individual who has served this document. This party must check one of the boxes next to the sentences at the bottom of this section (to indicate if the Notice was delivered personally, to another reliable party, or mailed using First Class Mail) before Signing this document.